Heading off to beautiful Miami Ohio University for the National Championship on Tuesday. Both Katelyn Drake and Kelsey Lamdin have qualified to compete against the best in country. Things seem to have come full circle for me this season. You know, my first job as college swim coach was at Miami Ohio as the Asst for the men's program. As the interim Head Coach at Kenyon, the two Natoinal titles the team won were at Miami, Ohio in 2002. And now in my first year at Bates, I am heading back to Miami for my first nationals as a Bobcat. It feels like I'm heading home... neat how things work out like that. Needless to say, the NCAA did a fine job picking one of the best pools in the country. It just doesn't get any better than this pool (check out those pictures). Check the blog for updates as we progress through the weekend. Inbetween great meals, fast swimming, beautiful diving, and a few other memorable moments, I am sure I will be able to post a few updates. Good luck Katelyn and Kelsey! Way to go, Pete. What a nice circle to close the season with. So glad Bates had the wisdom to snap you up! Enjoy the competition. Kelsey, keep an eye on the Judge for me. Katelyn, make sure Pete doesn't blow his eardrum out!!! I wish I could be there, but I am subbing at a local elementary schoo (figure that would give you a heck of a mental picture). 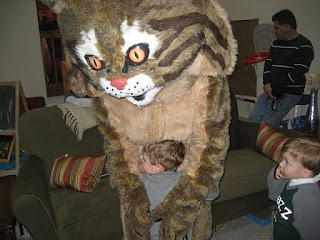 Also, that is not me in the bobcat suit giving andrew a hug (despite rumors). great job at nationals--i had so much fun checking out the results and seeing how the meet went!!! congratulations on an amazing season!